Stretching for over 60 kilometres of coastline, East Coast Road (ECR), the ‘state-of-the-art’ neighbourhood of Chennai is emerging as the hottest property and the most preferred destination for K’Town film stars. 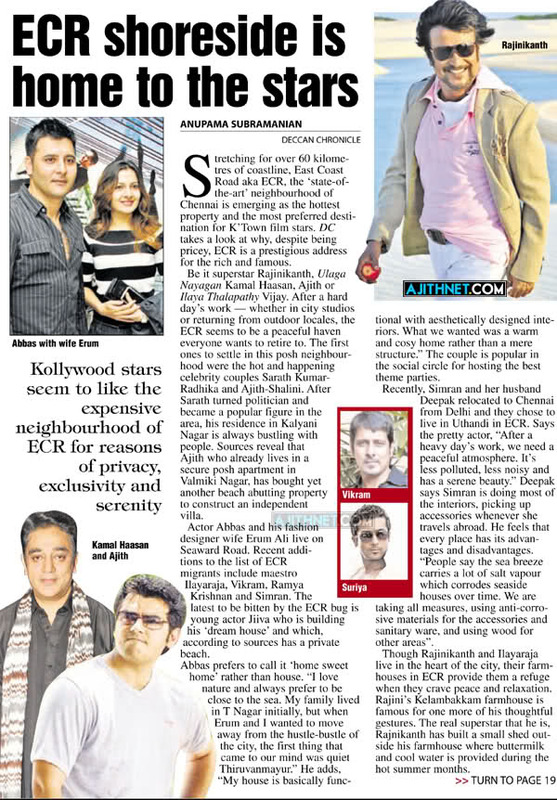 DC takes a look at why, despite being pricey, ECR is a prestigious address for the rich and famous. Be it superstar Rajinikanth, Ulaga Nayagan Kamal Haasan, Ajith or Ilaya Thalapathy Vijay. After a hard day’s work — whether in city studios or returning from outdoor locales, the ECR seems to be a peaceful haven everyone wants to retire to. The first ones to settle in this posh neighbourhood were the hot and happening celebrity couples Sarath Kumar-Radhika and Ajith-Shalini. After Sarath turned politician and became a popular figure in the area, his residence in Kalyani Nagar is always bustling with people. Sources reveal that Ajith who already lives in a secure posh apartment in Valmiki Nagar, has bought yet another beach abutting property to construct an independent villa. Actor Abbas and his fashion designer wife Erum Ali live on Seaward Road. Recent additions to the list of ECR migrants include maestro Ilayaraja, Vikram, Ramya Krishnan and Simran. The latest to be bitten by the ECR bug is young actor Jiiva who is building his ‘dream house’ and which, according to sources has a private beach. Abbas prefers to call it ‘home sweet home’ rather than house. “I love nature and always prefer to be close to the sea. My family lived in T Nagar initially, but when Erum and I wanted to move away from the hustle-bustle of the city, the first thing that came to our mind was quiet Thiruvanmayur.” He adds, “My house is basically functional with aesthetically designed interiors. What we wanted was a warm and cosy home rather than a mere structure.” The couple is popular in the social circle for hosting the best theme parties. Recently, Simran and her husband Deepak relocated to Chennai from Delhi and they chose to live in Uthandi in ECR. Says the pretty actor, “After a heavy day’s work, we need a peaceful atmosphere. It’s less polluted, less noisy and has a serene beauty.” Deepak says Simran is doing most of the interiors, picking up accessories whenever she travels abroad. He feels that every place has its advantages and disadvantages. “People say the sea breeze carries a lot of salt vapour which corrodes seaside houses over time. We are taking all measures, using anti-corrosive materials for the accessories and sanitary ware, and using wood for other areas”. Though Rajinikanth and Ilayaraja live in the heart of the city, their farmhouses in ECR provide them a refuge when they crave peace and relaxation. Rajini’s Kelambakkam farmhouse is famous for one more of his thoughtful gestures. The real superstar that he is, Rajnikanth has built a small shed outside his farmhouse where buttermilk and cool water is provided during the hot summer months. Hundreds of people thronging the place is a common sight; not only to relish the spicy buttermilk served there, but also hoping to get a glimpse of the star. Once, Alwarpet was synonymous with Kamal Haasan. The actor had made Alwarpet his abode, till a few years back, when he moved away from the city to the tranquil environs of Akkarai in ECR. Jiiva, who has bought property in a gated community in ‘Olive Beach’ near Ramya Krishnan’s house says, “I can call it my ‘Dream House’. I did lot of research before going for one near the beach. The house we are planning is more earthy and eco friendly. I once visited a sculptor’s house in France, which was built in the 16th century using natural materials. It was not lavish but very friendly and homely. I like the idea and will be applying it to my proposed residence. I am not going to use varnish or paint in my house”. What about facilities like schools and shops, and the problem of commuting to the city? Most of them feel ECR is worth the investment. Simran and Abbas concur. “Children are our priority. We have good international schools around here. Commuting is not a real problem – we can travel to work from anywhere. Nowadays, shootings are not restricted to the studios of Kodambakkam. We travel all over, to so many other places”. Jiiva feels that the ECR roads are broad and easy to drive on. “Even if my child has to travel to Adyar to school, it is not that far away”. A little birdie tells us that of late, Trisha has been toying with the idea of buying a property closer to her buddy Ramya Krishnan’s place and is seriously looking out for one! Lean back and soak up the sun in a villa overlooking the sea. At just 1 km from the beach on ECR and close to Cheyyur Lake, life’s a breeze at Bay View Villa plot with access to all shared facilities at MARG Swarnabhoomi. For Enquiry send mail to seo.marg@marggroup.com with your contact number (or) Kindly add comments below to this article with your contact number/mail.id .